Jodi Bean's Blog: Sweet Tea Paperie Summer Plate Giveaway! My first ever blog giveaway in honor of reaching 100 followers starts now! I'm very excited to host this giveaway and I think you are going to love it! We may be approaching Labor Day weekend but that doesn't mean that summer has to end! I'm holding up to that "summer feeling" just a tad bit longer by doing an awesome giveaway. Have you checked out Sweet Tea Paperie? Amanda has the most adorable items. I actually learned about her after winning my first ever giveaway. I just ordered my monogrammed iPhone case and I can't wait for it to arrive. While I was deciding what to use my $40 gift certificate for I also fell in love with these plates. Aren't they the cutest? Well I am giving one away. Actually I'm giving two away! When I choose the winner the person who sent them to my blog will also win! So in order to increase your chances to win you need to spread the word about my giveaway on your blog, Facebook and twitter! The more people you get to enter who state your name the better chance you have to also win! Get it? What are you waiting for? Share my button and spread the news!!! Winner will be chosen on Tuesday, September 13th!!! Want a plate now? Enter the discount code JodiBean and get 10% off your order! I follow your blog:) I think I found you through FTLOB! GFC follower Barb! I think that I found your blog via a blog hop! OH!!! OH MY GOSH! Those plates are friggin' ADORABLE! Did I mention I am re-doing my kitchen in pink?!? 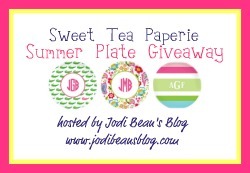 I love Sweet Tea Paperie and those plates are adorable! 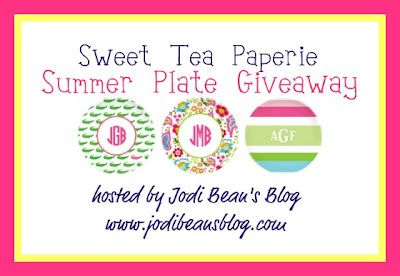 I heard about the giveaway from Amanda of Sweet Tea Paperie herself. I was referred by you because we have been friends for 15 years now! A little lovliness sent me!! A little loveliness sent me! I'm following your blog and look forward to reading more! Congrats on hitting 100! Melissa from A Little Loviness sent me. I'm a follower now. Congratulation on hitting 100 followers. Wow! Those are precious!! I am getting married in November and would LOVE that!! I now follow your blog!! I found you from Melissa at A Little Loveliness! These plates are adorable!! I found you through Kelly's Korner on twitter and I am a brand new follower! A little loveliness sent me...love the plates...fingers crossed! Melissa Lester's blog sent me. Thanks for the chance to win these super cute plates. 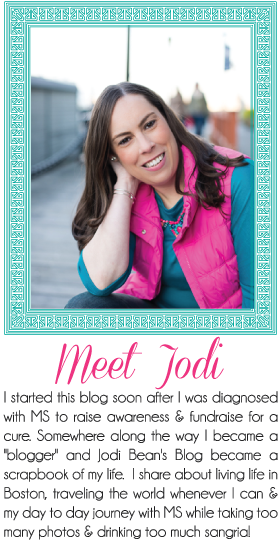 I think I read your blog for the first time because of Lisa Emrich's Carnival of MS bloggers maybe over 1 year ago. Nowadays I follow you on twitter and that's how I find out when there's a new post. If I were to win the plate I'd give it to my wife who loves that kind of things. I found out about your blog from A Little Loveliness! These plates are BEAUTIFUL! Would love to get matching ones for my baby boy and little girl! Thank you for a fun giveaway! I love this giveaway girl and all of their products. I just went to the website to check them all out!